Gov. 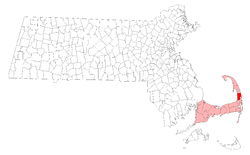 Thomas PRENCE (1599 – 1673) was a co-founder of Eastham, Massachusetts, a political leader in both the Plymouth and Massachusetts Bay colonies, and governor of Plymouth (1634, 1638, and 1657 – 1673). He was Alex’s 10th Great Grandfather in two ways, through Mercy and John Freeman and through Sarah and Jeremiah Howes making him two of 2,048 in this generation of the Shaw line. In addition, his daughter Elizabeth married the son of our ancestor Arthur Howland. Gov. Thomas Prence was born in 1599 at Lechlade, Gloucestershire, England a son of Thomas PRENCE Sr. an English carriage maker, and Elizabeth TODLERBY. Thomas emigrated to America in 1621 on the ship Fortune, arriving in Plymouth on 9 Nov 1621, just a few days after the first Thanksgiving. Prence married four times. He married Patience BREWSTER on 5 Aug 1624 at Plymouth, (the ninth marriage recorded in the colony). Their daughter Mercy is our ancestor. He married a second time to Mary COLLIER on 1 Apr 1635 at Plymouth, Plymouth County. Their daughter Sarah is also our ancestor. He married a third time to Appia Quicke before 8 Dec 1662 at Plymouth, Mass. Finally, he married his fourth wife Mary Burr HOWES between Feb 26 1665/66 and Aug 1 1668. Thomas died on 29 Mar 1673 at Plymouth, Plymouth County, Massachusetts. Mary Collier was baptized in 1612 at St Olave, Southwark, an area of south-east London in the London Borough of Southwark. Her parents were William COLLIER and Jane CLARKE. Mary died 5 Nov 1688 in Eastham, Barnstable, Mass. in the house of her son-in-law Jeremiah HOWES. Appia Quicke was born in 1602 – Kent, England. Her parents were William Quick (Quicke) and Elizabeth Hodges. She first married Samuel Freeman on 14 July 1624 at Saint Anne Blackfair, London, England. Appia and Samuel divorced, though the exact date is not known, see discussion below. She married Gov. Thomas Prence , before 8 Dec 1662 at Plymouth, Mass. Appia died before 1 Aug 1668 at Plymouth, Mass. I don’t think Thomas Prence’s son-in-law John FREEMAN is closely related to Samuel Freman. Mary Burr was the widow of our ancestor Thomas HOWES. Her parents and origins are unknown, and though her maiden name of “Burr” is known, her ancestry is largely unproven.Her son Jeremiah married Thomas’ daughter Sarah (see below) Mary died 9 Dec 1695 Yarmouth, Barnstable County, Mass. and is buried at Howes Burial Ground, Dennis, Barnstable, Massachusetts. 22 May 1627 Edmond Freeman Jr.
18 Jul 1651 Sandwich, Mass. 13 Mar 1672 at Probably, England; date of father’s will. 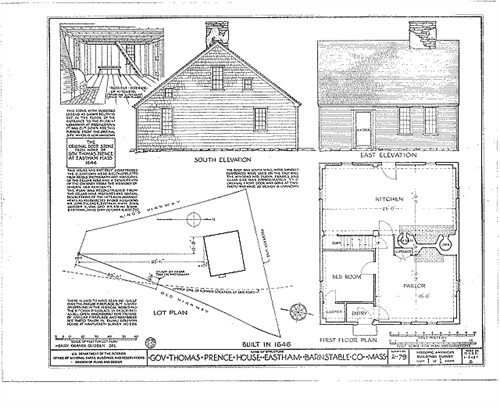 Thomas Prence House – 1880’s Built 1646 Eastham, Barnstable, Mass. Demolished. Thomas Prence was not part of those religious dissenters who sought religious freedom in America, but he apparently sympathized with them. Perhaps not knowingly, he took two steps that led to his leadership role. He married Patience Brewster, daughter of the community’s religious leader, Elder William Brewster, and in 1627 he became one of eight colony members who assumed the pilgrims’ debt to the London merchants who had backed establishment of the colony. 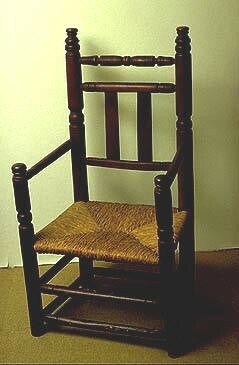 A chair belonging to Thomas Prence which now resides in the Pilgrim Hall Museum. Note that the back spindles on the Prence chair are flat for comfort. He was allowed to join with Bradford, Isaac ALLERTON and Standish as a member of the Trade Monopoly. He became governor of Plymouth, for the first time, in 1634; he was elected again in 1638 and served from 1657 to 1673. After the death of Governor Bradford in 1653, he became the leader of the Plymouth Colony serving in that capacity until his death. He was distinguished for his religious zeal, and opposed those that he believed to be heretics, particularly the Quakers. He became infamous for the banishment of those who would not conform to his specific church law, including Samuel Gorton, the first governor of Rhode Island. He restructured the local government to secure his position and led the persecution of numerous people for offenses such as smiling in church, harboring non-church members, and tending garden during the Sabbath. He also procured revenue for the colony’s grammar schools so future generations would be better educated. Governor Prence gave to Wamsutta and Metacomet, the sons of Massasoit, the names Alexander and Philip as a compliment to their warlike character. 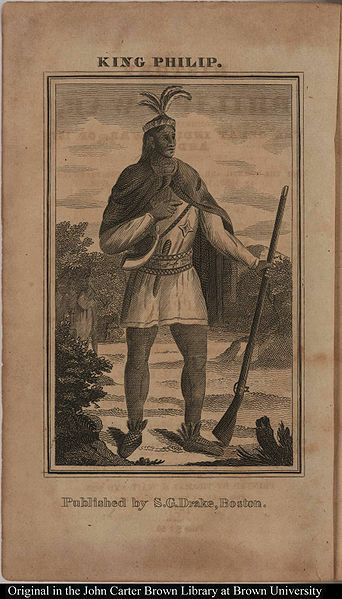 While governor, Prence developed an important relationship with the powerful Wampanoag sachem Metacomet. On the death of the governor in 1673, Metacomet, known to the English as King Philip, was left to work with the new governor, Josiah Winslow, who he hated. The Wampanoag-English relationship soon broke down and the bloody King Philip’s War followed in 1675. 2 Jul 1667 – Arthur Howland, Jr., was brought before the General Court again where he “did sollemly and seriously engage before the Court, that he will wholly desist and never apply himself for the future as formerly he hath done, to Mistris Elizabeth Prence in reference unto marriage.” Guess what happened! They were married on December 9, 1667 and in time had a daughter and four sons. Thus a reluctant Thomas Prence acquired a Quaker son-in-law, Quaker grandchildren and innumerable Quaker in-laws of Henry Howland. From The New England Historical and Genealogical Register 1943, vol. 97, p. 393 by Ella F. Elliot, Somerville, Mass. The fact that Samuel and Apphia (Quicke) Freeman were divorced has, apparently, escaped the attention of historians of this interesting Watertown couple. The proof, conclusive though indirect, was seen by this contributor many years ago while preparing an article on the marriages of Governor Thomas Prence of Plymouth and Eastham, Mass., who became Apphia’s second husband. (Mayflower Descendant, 6: 230-235.) The long cherished hope of finding the direct evidence has not been realized; possibly the records no longer exist. Among the files of the Supreme Court of Suffolk County, Mass., is the case of Jane (also called Joane) Halsall vs. George Halsall for divorce. (File No. 257.) The papers in this case bear dates in 1655 and 1656; and the case of “Mrs. Freeman sometimes of Watertown” is cited as a precedent. From mentions of his name in the Watertown Land Grants, it seems likely that he was alive in 1644, or later. Note: A resume of the Halsall divorce case may be seen in Whitmore’s Colonial Laws, 1890 edition, pp. 99-100. Rebecca’s husband Edmond Freeman Jr. was born 26 Nov 1620 in Billingshurst, Sussex, England. His parents were Edmond FREEMAN and Bennet HODSOLL. Edmond died before 5 Jan 1703/04. Jane’s husband Mark Snow was born 9 May 1628 in Plymouth. His parents were our ancestors Nicholas SNOW and Constance HOPKINS. Nicholas arrived on the Ann & Little James in 1623. Constance was a 14 year old Mayflower passenger traveling with her father and stepmother. Mark first married 18 Jan 1654 Eastham to Anna Cooke and had one daughter Anne Snow (b. 1656), three weeks before Anna’s death. Mark died 9 Jan 1695. Constance’s father Stephen HOPKINS (wiki), was recruited by the Merchant Adventurers to provide governance for the colony as well as assist with the colony’s ventures. He was a member of a group of passengers known to the Pilgrims as “The Strangers” since they were not part of the Pilgrims’ religious congregation. Hopkins was one of forty-one signatories of the Mayflower Compact and was an assistant to the governor of the colony through 1636. He was a veteran of a failed colonial venture that may have been the inspiration for Shakespeare’s The Tempest. Anna Cooke was born in 1636 in Plymouth, Plymouth Colony. Anna died 25 Jul 1656 in Eastham, Barnstable, Mass. Her parents were Josiah Cooke (b: ~ 1610 in Leyden, Zuid-Holland) and Elizabeth Ring (bapt. 23 Feb 1603 in Ufford, Suffolk, England) Her maternal grandparents were our ancestors William RING and Mary DURRANT. Mary’s husband John Tracy was born 1633, Duxbury, Plymouth, Mass. His parents were Stephen Tracy (ch. 1596->1655) and Tryphosa Lee (~1597-<1655) Stephen immigrated in Aug 1623, Plymouth aboard the Ann. Tryphosa immigrated in 1625, Plymouth aboard the Jacob. John died 3 May 1718, Windham, Windham, CT in his 85th year. Elizabeth’s husband Arthur Howland was born ca. 1633 England. His parents were Arthur HOWLAND and [__?__]. Arthur died 2 APR 1697 in Marshfield, Mass. Judith’s husband Isaac Barker was born in 1642. His parents were Robert Barker and Luce [__?__]. Robert’s wife Luce was not dau of John and Anne Williams. Robert’s brother John did marry Anne Williams dau of John Williams. Isaac died in 1710. His father Robert came to America 1632 to Plymouth, MA removed to Marshfield, Plymouth, MA 1643 and then to Duxbury 1653. Robert was first an apprentice of John Thorpe and then of William Palmer. Robert held serval offices in each town he lived in. Robert was a bricklayer in 1640 and bought 40 acres of upland that year, was part owner of the ferry his brother John ran in 1641. 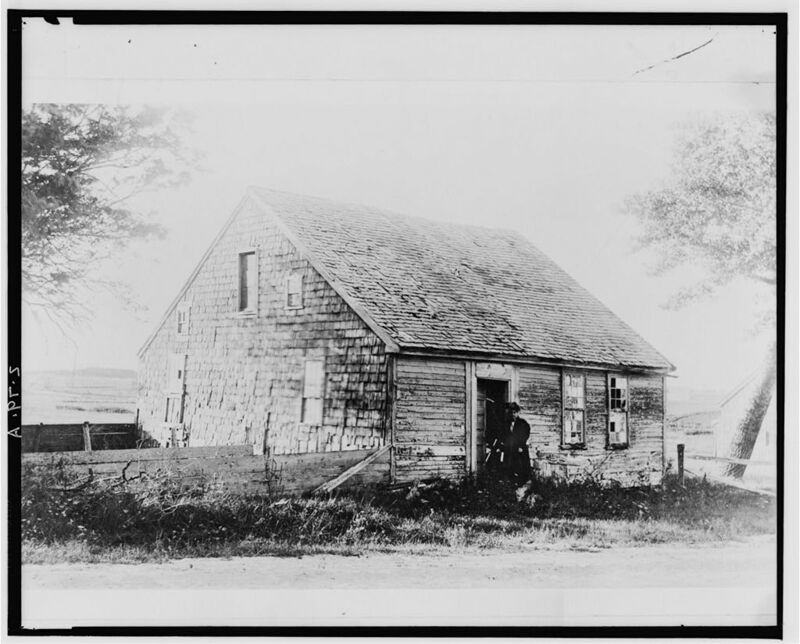 Robert bought 100 acres in Marshfield, Plymouth, MA and was a member of the Marshfield military company under Lt. Nathaniel Thomas in 1643. He was a surveyor at Marshfield in 1645 and 1648 and at Duxbury in 1654, 1672, 1677 and 1679. Was Constable at Marshfield, Grand juryman and admitted freeman 6 June 1654. In July 1646 he was licensed to keep an inn in Marshfield to retail wine which he stopped in 1666. This entry was posted in 12th Generation, Double Ancestors, First Comer, Immigrant - England, Line - Shaw, Pioneer, Public Office, Storied, Wikipedia Famous and tagged Divorce, Eastham, Gave Metacomet his name King Philip, Governor of Plymouth, Metacomet, The Fortune 1621, Wamsutta, William Brewster. Bookmark the permalink. Regarding which children belong to which mother – specifically, Mary Collier vs. Apphia QUICK Freeman – have you read about: “In 1903, Ella Florence Elliott was able to show that the widow Mary was a different Mary from his second wife, based on clauses in Prence’s will and items in the widow Prence’s inventory that clearly indicated she had been a widow before marrying Prence, something that was not true of second wife Mary Collier. This incredibly detailed discussion had gone on for decades before Ms. Elliott’s Mayflower Descendant article [6:230-35] finally allowed all the pieces to fall into place. 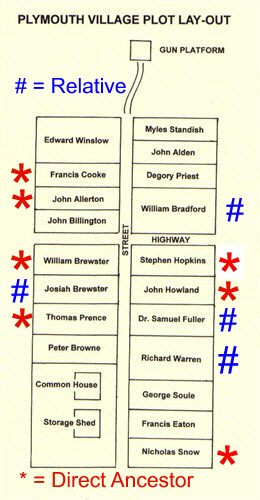 Thus, Thomas Prence m. (1) Patience Brewster, m. (2) Mary Collier, m. (3) Apphia (Quick) Freeman (divorced from Samuel), m. (4) Mary (Burr) Howes (widow of Thomas). Establishing the probable date of marriage for Apphia and Thomas Prence has significant implications for the parentage of Prence’s last three children (Judith, Elizabeth and Sarah). Apphia is last seen as a Freeman 1 July 1644, about a year before the birth of Prence’s seventh child, and at the end of a six- year hiatus in the birthdates of his children. She is called “Mrs. Freeman” as late as 15 October 1646 in a deed where she appears as an abutter, but this does not necessarily imply that she had not remarried by this date, since it was not unusual for archaic bounds to be used in this sort of description [ SLR 1:78]. In a letter dated at Plymouth 8 June 1647, Thomas Prence wrote to John Winthrop that “since my parting company [with you] I have almost met with Jacob’s trial in his travel between Bethel and Ephrath: God’s having been heavy upon my wife and that for diverse months and is not yet removed” [WP 5:169]. In Genesis 35:16-19 Jacob’s favorite wife Rachel died between Bethel and Ephrath after giving birth to a son she named Benoni, but he called Benjamin. Prence here is referring to the birth of his own daughter Elizabeth, apparently a difficult childbirth.” ElisabethBendersHyde49 shared this information. Okay, this is fascinating. We’ve “met” here before because my great-grandfather David McCaw fits somehow on your tree. Now I’ve been researching another part of my mother’s tree, starting from her 2x great grandmother, Mary Freeman Gallaher. I’ve traced her Freeman ancestors back to Mercy Prence/John Freeman and on back to William Brewster, the Mayflower passenger. And one of my “hints” on these folks has sent me back to you. So I gather we’re related somehow through this line as well?